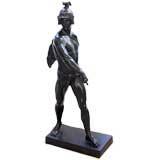 This 19th Century Bronze Sculpture of a Roman from Gladenbeck, Berlin is no longer available. 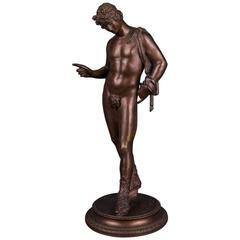 Finely chiselled cast bronze statue of a Roman coming out of the bath putting on his sandals from the second half of the 19th century manufactured by the famous Berliner foundry Gladenbeck. Signed Akt-Ges v.H. Gladenbeck und Sohn. 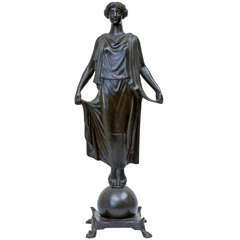 Classical bronze figure in the Greek style. Wonderful aged patina. 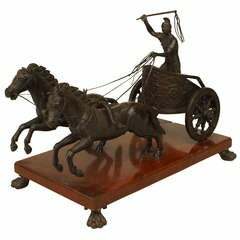 The large scale and movement of the sculpture provide a great opportunity to add drama to any room. Cast in the lost wax method, the sculptures details are seen from all sides. 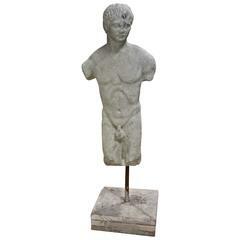 Beautiful Italian late 19th century marble torso of boy, show it to your better half.